WEST LAFAYETTE, Ind. — Purdue University’s 52nd annual Grand Prix kart race will take place Saturday (April 25) on a brand new track, located at the corner of McCormick Road and Cherry Lane. The previous track, which was used for more than four decades, was eliminated to make way for the renovation and expansion of Mackey Arena. This year 33 student drivers will compete for the trophy in what has been called the “Greatest Spectacle in College Racing.” The event’s grand marshal is Dustin Keller, a former Purdue football player who now plays for the New York Jets. Keller, a West Lafayette native, earned his degree in Organizational Leadership and Supervision. Qualification races took place Saturday (April 18). The top 27 teams that qualified will be in the main event on race day. The rest of the teams will compete in three sprint races on race day to fill the other six positions. 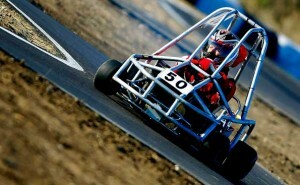 The top two karts from each sprint race will enter the main event to round out the 33-team starting grid. The 150-lap feature race starts at 2:30 p.m. Saturday (April 25) with driver introductions and the national anthem. Pits are open to the public from 10-11 a.m., and track seating is open to the public at 10 a.m. Practice is from 10:10-11 a.m., and heat races start at 11:20 a.m. Parking is available near the north half of Ross-Ade Stadium, Lot H, at no cost. In addition, campus parking garages are free to visitors on weekends. Buses also will be shuttling spectators to the track. Pickup points will be at Ross-Ade, Stewart Center and the Recreational Sports Center. In the event of rain, the race will be delayed to wait for a break in the weather. If rain persists, the race will be rescheduled for Sunday (April 26). Tickets are $7 in advance or $10 at the gate. Programs are $3, and the official Grand Prix T-shirt is $10. A race package also is available for purchase this year. The $15 cost includes a ticket, race program and a T-shirt. Advance tickets will be on sale from 9 a.m. to 4 p.m. through Thursday (April 23) at two locations: on the Engineering Mall outside the Materials and Electrical Engineering Building and outside the Class of 1950 Lecture Hall. Tickets also will be sold on Memorial Mall from 9 a.m. to 4 p.m. Friday (April 24). The rain location for ticket sales is in the main lobby of Stewart Center. Trost said Grand Prix isn’t only for those who attend Purdue but also for the entire community. The Grand Prix Student Ambassadors will promote the event before the main race. They are Rebecca Pankop of Albion, Ind., who’s graduating in May with a bachelor’s degree in nursing, and Max Vande Vaarst of Wayne, N.J., a sophomore majoring in English education and history. Ambassadors serve as spokespeople for the Grand Prix Foundation, encouraging race support and business sponsorship and perform other duties. The ambassadors each received a $1,000 scholarship from the Purdue Grand Prix Foundation. Fifteen other students received scholarships ranging from $250-$750. The Grand Prix Foundation will host a recognition and victory banquet at 6:30 p.m. Monday (April 27) at University Inn, 3001 Northwestern Ave., West Lafayette. All drivers and team members are invited to attend. The Purdue Grand Prix Foundation is a student-run, nonprofit group that conducts the kart race and related events to raise money for scholarships. The foundation also receives money from Toyota Motor Corp., Coca-Cola, Purdue Intercollegiate Athletics, WAZY 96.5, WLFF 95.3, WSHP 95.7, Purdue Memorial Union, Bosch, Lockheed Martin, Bowen Engineering and Army ROTC.